June 29. Welcome, to this week&apos;s newsletter. Have a great 4th of July weekend. The next issue of this newsletter will be July 13. If you are reading this but don&apos;t have your own free subscription, here is where you can sign up. Over the past few years we have had an unbelievably good response to Member surveys on subjects like where you&apos;ll retire, spousal compatibility, retirement finances, planning, and Medicare. This article gives a quick summary of all those results, plus links to the full reports and actual comments of some participants. 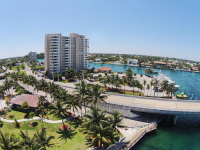 This surprisingly affordable beach town is in the heart of South Florida&apos;s Atlantic Coast. It is home to one of the biggest established active communities anywhere, Century Village. Our member surveys are fast and easy - and ever so interesting when everybody participates. This one asks a few quick questions about where you will retire. If there are enough responses we&apos;ll have a complete report on topics including: where our Members intend to retire, how they will pay for it, and how far they might move. Please take it now!